It was still dark when we arrived in Keflavik at 5:50 this morning. We puttered around the duty-free shops before picking up our luggage, loading up the rental car, and heading out into the bizarre Icelandic countryside. We drove south on the Reykjanes peninsula, the most southwesterly tip of Iceland, stopping to clamber over the volcanic landscape as the overcast morning brightened. What a strange place! 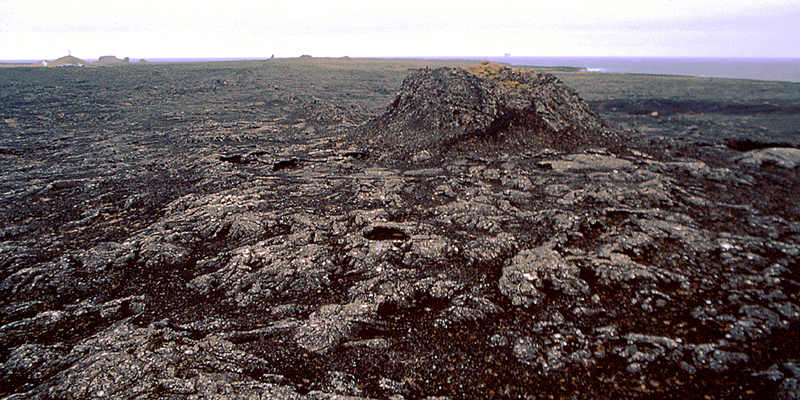 A major lava flow covered this area in the thirteenth century; “moonscape” is too mundane a word to describe it. We crawled to the very edge of sheer cliffs hundreds of feet high and peered out at sea stacks and odd-shaped islands, and down at sea birds riding the updrafts. 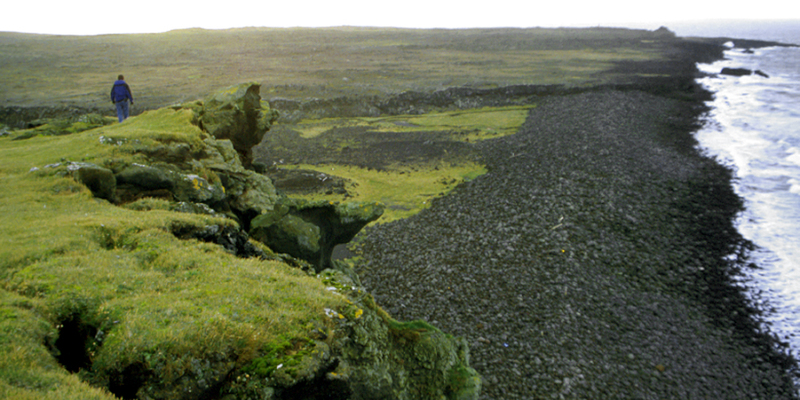 Through Hafnir, a fishing port on the edge of the lava field, we drove to the Blue Lagoon, smack in the middle of it. Here, a geothermal energy plant (one of several we saw during the day) uses the heat and pressure of superheated groundwater to produce power for Reykjavík. The runoff, cooled to a bearable 103 or 104 degrees F., is used as an enormous spa. The mineral-rich water is a lovely turquoise, similar to the glacial lakes in the Rockies, but much more opaque; one cannot see more than a few inches down into it. The minerals seem to precipitate on the skin. Despite a thorough shower, I could feel a microscopic crust on myself hours later. It seems to be quite healthful. We found our way into Reykjavik and to our lodgings at Flókagata 1. An intended late lunch became an early dinner, followed by a pub crawl. There are a few nice pubs here, but not much in the way of decent beer--Guinness is available at several places. It’s very quiet, too, but it’s also early in the week. 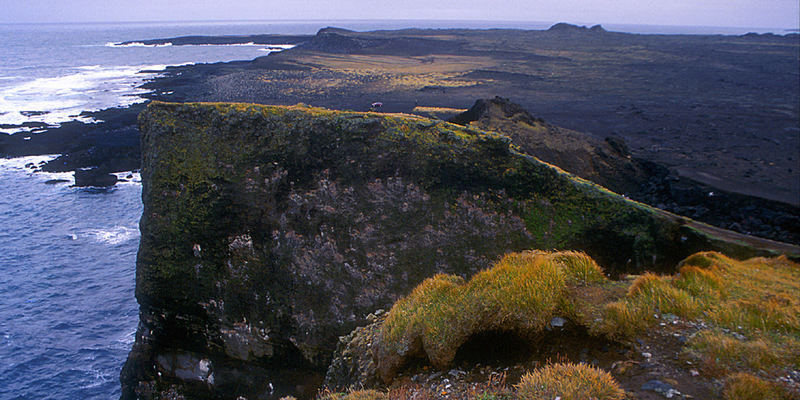 This lava flow on the Reykjanes Peninsula occurred in the 13th century. 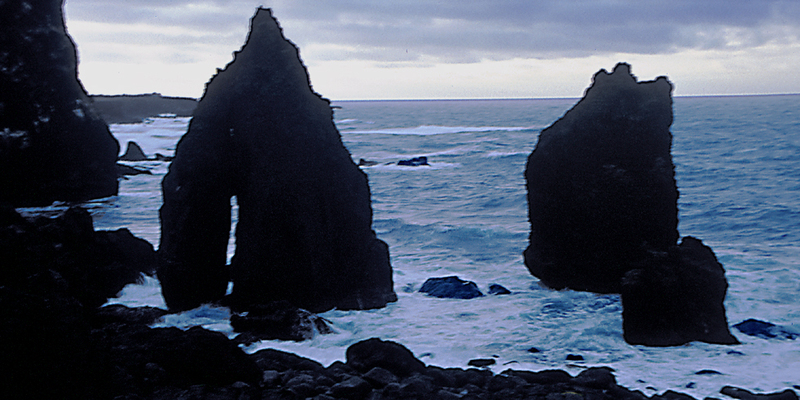 Peculiar igneous stacks on the Reykjanes coast. 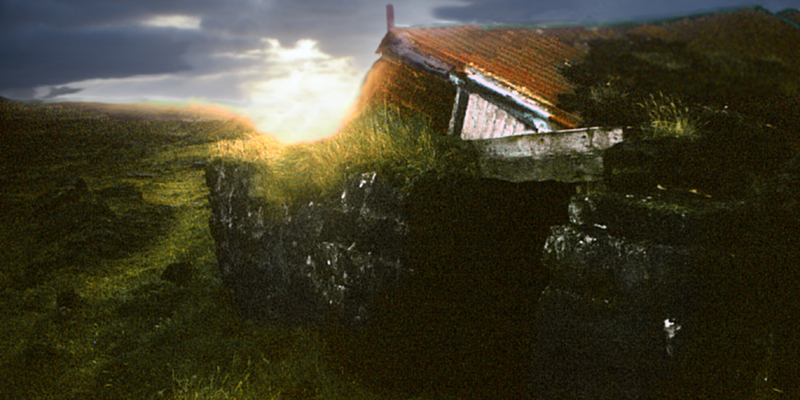 An abandoned shed at sunrise. 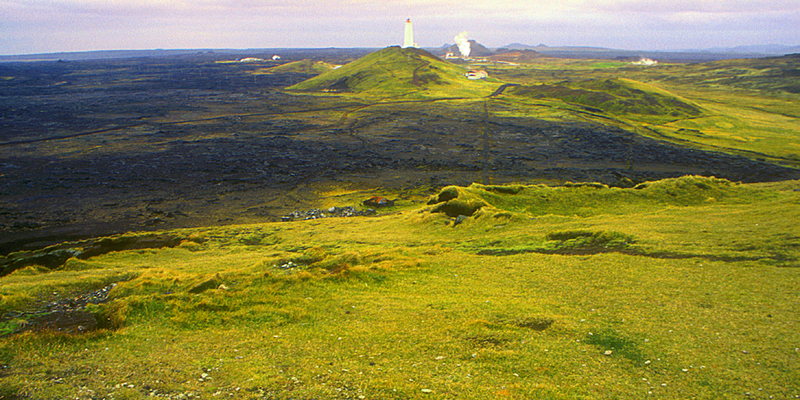 An oddly-sited lighthouse, and a mysterious geothermal energy plant. 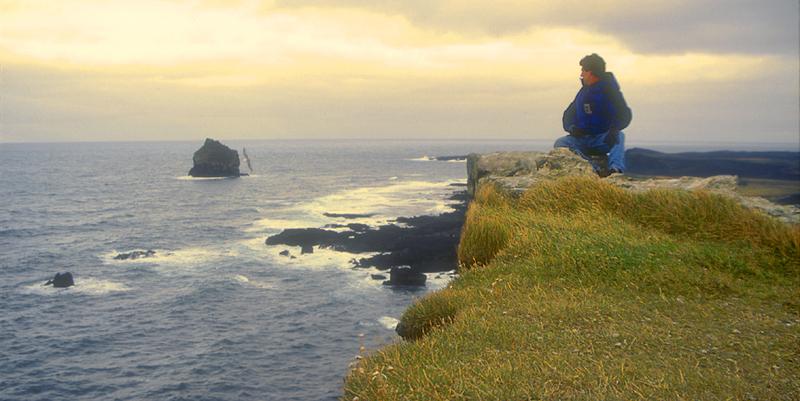 Win contemplates the sea stack called Karl. Gnarly cliffs overlooking the beach. 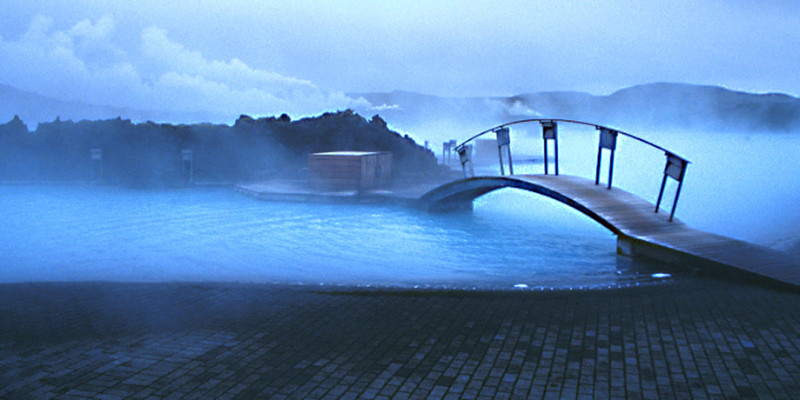 The famous Blue Lagoon. Where are the bikinied Icelandic babes?